Manufacturers specially in Small & Medium segment are increasingly focusing towards adopting lean manufacturing practices in their organization. They want to keep close tabs on their machines, monitor its health every second, limit machine downtime to the lowest and eliminate processes/activities that are non-productive for them and their customers. In a nutshell, increase capacity for more profitability with strong’ and efficient machines. So how can manufacturers achieve this? Machine Monitoring System is an integrated technology set that enables machines to continuously talk to machine control devices and provide minute-by-minute data about the processes they are running, time to complete an activity, material quantity/number they are processing, personnel operating it and reasons for idle/downtime. This data is continuously relayed to shop-floor supervisors & operating personnel, plant managers and shop-owners in different forms helping them to monitor machine setup, production, output quality, downtime and allowing them to quickly respond to disruptions, take informed decisions on customer orders and prioritization, and increase production up-time. In all, it helps increase Overall Equipment Effectiveness (OEE) and factory performance. The entire system requires an initial investment to be made on procuring machine monitoring software, machine control devices and monitoring sensors that are integrated with the machines. The implementation needs to be extensively tested and approved as a part of pilot implementation program or a phase-wise implementation approach. An ERP handles end-to-end manufacturing processes and integrates them into a common loop. It primarily takes care of Order Management, Inventory Control & update, Production Scheduling, Financial Accounting, Sales Management and much more. The ERP prioritizes customer orders as they come and schedules production. With each production phase, the machine control devices from each machine involved sends material utilization, scrap generated, time spent by machine/personnel etc. data to the ERP. The ERP updates the inventory levels and also the Work Order with relevant details after each production phase till the production is complete and the Work Order is closed. 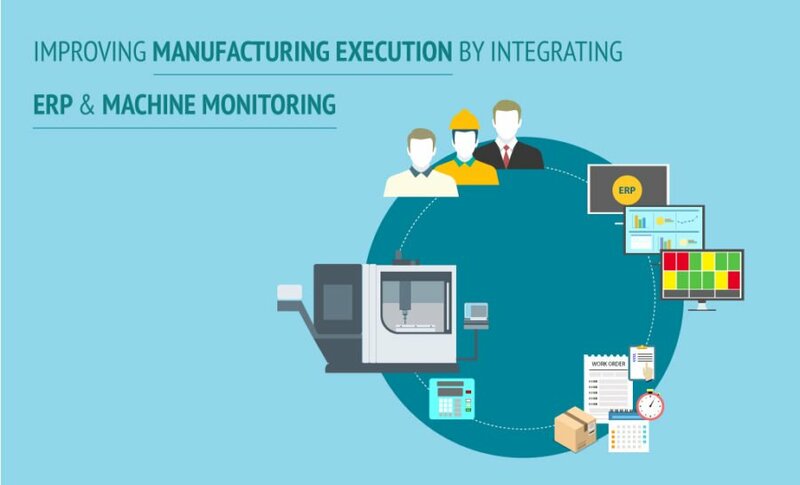 While Machine Monitoring is used to monitor machine health & performance, it needs to be linked to the larger loop of ERP to complete the Manufacturing Execution System (MES). 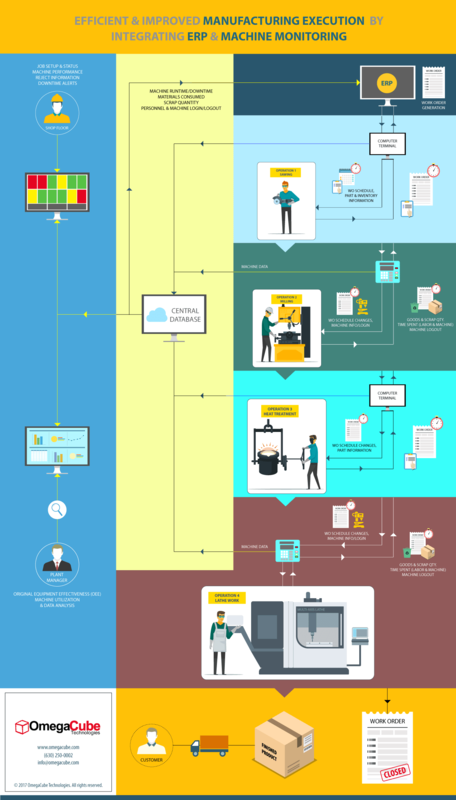 Our infographic below highlights a scenario of an integrated factory environment where machine monitoring system & ERP work in tandem to streamline MES for the manufacturer. Many manufacturers have realized the potential of automating their factory operations that require minimum human intervention. Right from customer order till production, each phase is seamlessly handled by the system thereby increasing capacity leading to more sales per employee, faster production, near perfect on-time delivery, reduction in overhead costs, increased profitability and happy customers. Thank you so much! We are glad that our blog post has benefited you. Stay tuned for more insightful information on our blog section. Have a great day ahead!